Summary: STPS seeks to improve the quality of our educational displays, "turtle watch" presentations, and other educational presentations. 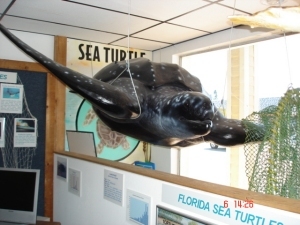 The requested display materials will allow visitors to our office to learn about the importance of Brevard County as a sea turtle nesting area. We also seek to reduce disturbance of nesting turtles during the turtle watches by using night vision scopes, and enhance the quality of the events through sea turtle replicas. The nest replica will enhance the many classroom presentations that STPS will conduct in the upcoming year. STPS also participates in Florida Sea Turtle Stranding and Salvage Network, covering most of Brevard County, which leads the state in strandings each year. As the number of sea turtle strandings in Brevard County increases, there is a need for more trained and equipped stranding personnel. With this grant, STPS will purchase equipment, such as GPS units and cameras, to increase area covered and response time to strandings.